Solution: Butane gas is compressed and used as a liquid fuel in disposable cigarette lighters and lightweight camping stoves. Suppose a lighter contains 5.82 mL of butane (d = 0.579 g mL). (a) How many grams of oxygen are needed to burn the butane completely? (b) How many moles of H2O form when all the butane burns? (c) How many total molecules of gas form when the butane burns completely? Butane gas is compressed and used as a liquid fuel in disposable cigarette lighters and lightweight camping stoves. Suppose a lighter contains 5.82 mL of butane (d = 0.579 g mL). (a) How many grams of oxygen are needed to burn the butane completely? (b) How many moles of H2O form when all the butane burns? 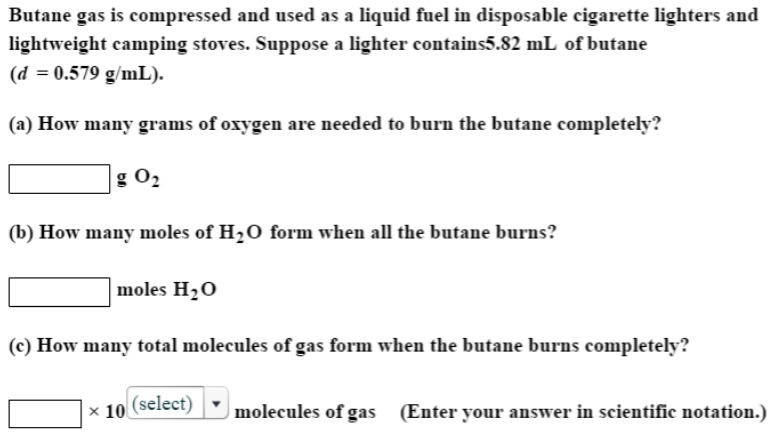 (c) How many total molecules of gas form when the butane burns completely?